As we look back on the year that was, it seems we may be living through a critical moment in the evolution of our sport. Allegations of widespread doping have rocked the international sporting community to its core; rowing has not escaped unscathed. Whether this is simply a flurry of instances isolated within certain nations, Russia in particular, or the seismic rumblings of something far more widespread, only time will tell. One thing is certain: The stakes of winning and losing on rowing’s biggest stage—and even just getting there—are higher than ever. Amid all the advances in training and technology, it would be naive to think that athletes, coaches, and nations are blind to the temptation to enhance performance through more than hard work. Despite the rules, regulations, and public punishments meted out for doping, the question lingers: Where is the line between simply upping your game and cheating? Whether a teenage novice or 95-year-old veteran, rowers and coaches often take their cues from the national team and USRowing is embracing sport science like never before. Supplementation is definitely a part of what happens at the highest level of sport, but it may not be exactly what you think. “Neither USRowing nor the USOC endorses the use of any specific supplements” says Fusco. “The decision and responsibility rests completely on the athlete. What I do is educate athletes to make the smartest and most informed choices.” One helpful tool for decision-making, offers Fusco, is the sport supplement framework created by the Australian Institute for Sport, which ranks supplements based on their safety, legality, and effectiveness. For all athletes, Fusco stresses the importance of consulting with sport scientists, whose job it is to stay up-to-date on the latest research findings by attending conferences and keeping abreast of new studies. While not specifically endorsed, two supplements that some rowers on the U.S. squad use are beet juice and beta alanine. “Beet juice is high in dietary nitrate,” says Fusco. “Nitrates stimulate vasodilation (the widening of blood vessels) and improve the delivery of oxygen and nutrients to working muscles, which has been shown to benefit high-intensity performance lasting between five to 30 minutes.” Consuming dietary nitrate, she says, combined with the right training stimulus can speed exercise recovery and increase exercise tolerance and power output. “Beta alanine is the ‘beta’ form of the amino acid ‘alanine’ that the body then uses to make a compound called carnosine,” explains Fusco. “Consistently supplementing with beta alanine for one to two months can increase carnosine levels within muscle, which has been shown to enhance high-intensity exercise lasting between one and seven minutes.” There are three possible ways that increased carnosine might improve performance and reduce fatigue says Fusco. “It can help regulate intracellular pH by buffering hydrogen ions in skeletal muscle, enhance uptake of calcium into muscles for contraction, and may reduce oxidative damage.” These effects “would likely be felt in the final sprint of a race,” Fusco concludes, although the degree of effect may vary from person to person. “Low to moderate doses of caffeine activate receptors in the brain and body that can counteract the inhibitory effects fatigue has on mental and physical performance,” says Fusco. “Research in athletes has shown that it may enhance endurance performance by increasing voluntary muscle contraction while reducing perceived effort and pain sensations.” Higher amounts of caffeine, however, have been shown to increase the risk of anxiety, jitters, elevated resting heart rate, disrupted sleep, and can have a diuretic effect. “It is important to consume a well-balance diet,” says Hannafin, “complete with protein, carbohydrates, fruits, and vegetables. Something as simple as a daily multivitamin can be useful, particularly in an athlete whose diet is not well-balanced.” Fusco acknowledges that access to sound nutritional guidance can be a challenge for those outside of the national team setting. 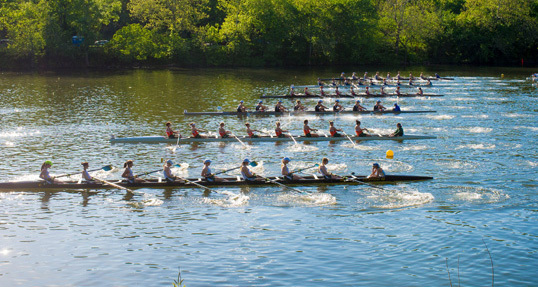 “Rowers don’t have a lot of opportunities to work with sports dietitians and receive focused nutrition education,” she says. “Historically, that means that the athletes have had to figure out their nutrition on their own. With the recent increases in collegiate sports dietitians, I am hopeful that will soon change.” Supplements may be what come to mind when one thinks about enhancing their performance, but gaining an edge can also be about what you put on your body, not just in it. Practices range from the practical to the bizarre, from clothing (compression gear, cooling vests) to emersion techniques (ice baths, hot and cold showers), to physical treatments (massage, cupping), to futuristic technologies such as transcranial direct-current stimulation. The science behind each of these is still evolving and studies are conflicting on their effects. Use can also differ between training and racing, so it is important to do some research before simply doing something because it’s the latest trend. “One of my main questions to athletes in counselling is what supplements they’re taking—not only the type but also the brand and source,” says Hannafin. “I do this in order to understand whether the product is safe, does what it claims to do, and is appropriate based on performance goals, training phase, and overall athlete development,” she says. “Even if an athlete is taking something with evidence to support it, it will not have any effect unless it’s the appropriate dosage, taken for the right amount of time, and in the right phase of training. It also doesn’t work for all sports or distances.” “Measuring performance benefits and being able to specifically attribute it to a supplement in a non-research setting is extremely difficult, if not impossible,” Fusco continues. “There are so many factors that can play a role in performance. It’s more about whether the athlete feels they are benefitting from it enough to warrant the risk, effort, and money required to take it.” The truth is that supplements can never be fully guaranteed to be completely free from contamination that may lead to a positive result on a drug test. Hannafin doesn’t mince words when it comes to playing it safe. “There is no magic supplement bullet,” she cautions.